Use EDI and modern web service protocols to integrate your B2B network with best-value Dell Boomi Exchange licences. Boost your ROI with partner advice, fast implementation, and optional services. We sell cost-effective licences for Dell Boomi Exchange, as well as all other elements of the Dell Boomi platform. Trust in the impartial expertise of a UK Dell Boomi Partner. Dell Boomi Exchange licences are an additional B2B and EDI management solution for the central Dell Boomi Integrate licence. Dell Boomi solutions are available in five formats: Base, Professional, Pro Plus, Enterprise, and Enterprise Plus. Base Edition: starter solution for SMBs to integrate two applications. Professional Edition: for businesses looking to fully integrate their back- and front-offices. Pro Plus Edition: additional functionality to support real-time integration needs. Enterprise Edition: advanced features to support complex enterprise needs. 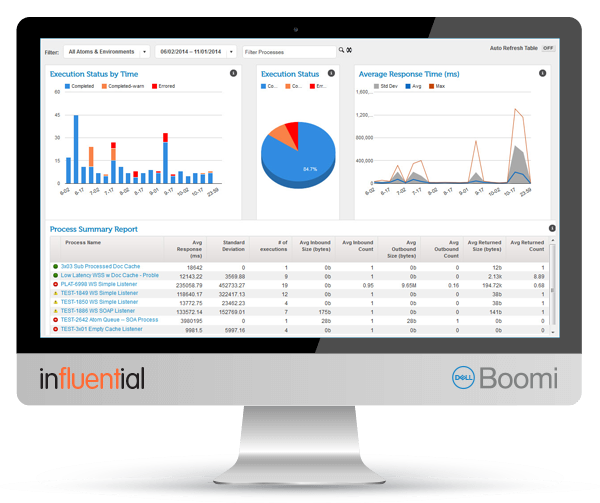 As an experienced Dell Boomi Partner, Influential Software can meet all customisation and implementation needs when required. Dell Boomi comprises five solutions – Integrate, Mediate, Hub, Exchange, and Flow – that let you connect applications, data, and people across cloud, on-premises, and hybrid networks. Our Dell Boomi UK Partner status is proof of our hands-on knowledge of Dell Boomi in real business situations. Acting as impartial consultants, Influential Software provides the objectivity your business needs when making software investments. In addition, we offer full services to make sure your software is perfectly configured and supported, so you get the maximum return. For more about our services for Dell Boomi, why not visit our dedicated site? Complete this form and we'll call you back! If you're unsure of what you need contact us and we'll give you a little extra help. Talk to one of our online consultants now for advice.